Your house is haunted. You can’t stand living with the ghosts anymore and decide to call in the professional, a ghost hunter. The ghost hunter comes, nicely equipped with all kinds of shiny ghost hunting equipment, and proceeds to immediately pass out and fall to to the floor with a loud thud at first sight of the ghosts. 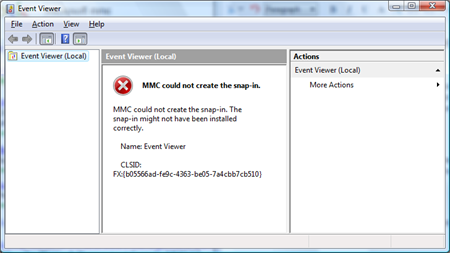 Well, in a nutshell, that is the story of the new Event Viewer in Windows Vista and Windows Server 2008. The new Event Viewer looks very nice and all. Trouble is, it now won’t work when there is a syntax error in machine.config or other .NET Framework problems. Apparently, in Windows Vista and Windows 2008, someone at Microsoft decided to rewrite the Event Viewer utility (a perfectly usable and solid utility in previous versions of Windows) in .NET. So, the lesson I learned from this is: don’t hire ghost hunters who are afraid of ghosts. Or, don’t write a utility designed to view monitoring and troubleshooting messages that can fail due to unnecessary dependencies. 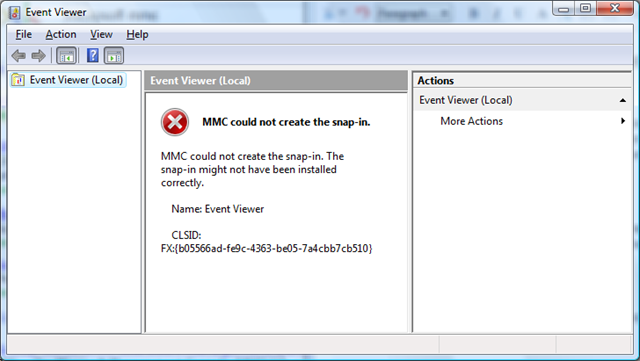 A critical system troubleshooting utility such as Event Viewer should be the last thing that fails. What to do when you cannot run Event Viewer in Windows Vista/Windows Server 2008/or Windows 7? Fix any syntax errors in machine.config. Restore to a previously known working copy.